WIAW~You Need Food For This, Right? I think you all know how I love participating in What I Ate Wednesday hosted by Jenn at Peas & Crayons. It’s fun, I find new blogs to read, I get food ideas. All makes sense doesn’t it? Even the badge is pretty with all of those colorful foods. Then why have I not been taking photos of my food lately in order to share them? I guess I haven’t felt that my food has been photo worthy. I’m in a slump and that’s not good. I’m hoping that reading all of the fun posts on WIAW today will get me back in the food whirl. I’ll share what I’ve got, but don’t judge me by this. On Monday we had the treat of going to lunch with Ralph’s son Bill and his sons Alex and Patrick. They all had the day off because of the holiday. We grabbed the chance to get together with them. I had spent an hour our so in the morning working with sister Ele at her church. They’re closing down the rummage sale. 😦 We spent the morning boxing up everything. The good thing is that it’s all being donated to a thrift store for a school for special needs children. I was happy they decided to do that. I picked up a few last treasures before leaving…can’t help myself. But back to the food. We went to the diner that we like so much and I got what has become my favorite regardless of which meal I’m supposed to be eating. Mushroom and spinach omelette with a sprinkle of spaghetti cheese on top and cottage cheese instead of potatoes. 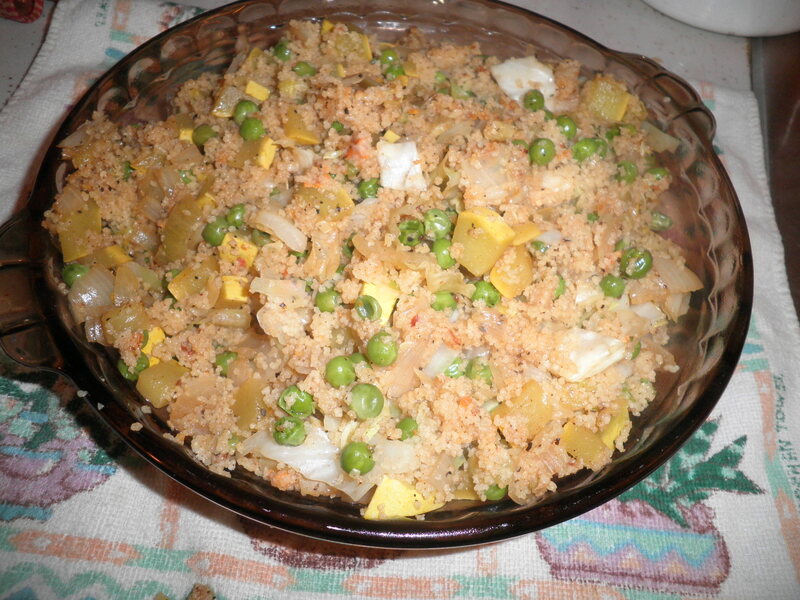 It is tasty and adding the extra veggies makes it more filling. I’m liking that choice. Dinner on Tuesday night was the first time I’ve actually cooked for myself in over a week. I’ve been eating mostly veggie burgers. They’re good in a pinch, but they’re not as filling and that may be the reason I’ve been having trouble with snacking. I took care of the filling issue in quick order. I saved myself a step here. Sautéed onions, yellow squash, cabbage, green peas (still trying to clean out the freezer!) and cottage cheese. Some spices of course. I added veggie broth all along, then at the end added some extra broth and three-quarters of a cup of dry couscous. Didn’t have to cook the couscous separately. It was very good and I realized how much I miss my dishes like this. I need to head to the produce market to re-stock, today. So that’s it for WIAW for me today. I warned you, there wasn’t much, but I promise that next week I’ll be back to my old veggified self! Be sure to stop over to Peas & Crayons to check out what everyone’s eating today. Oh, yes…leave some comments! Happy What I Ate Wednesday! It’s only 13 degrees out! Yikes!! Lol. 9 degrees. “Feels like -2.” I think I have you beat 😉 Stay warm!!! You do have me beat, Madison! I couldn’t even work on the computer in the rest of the day…my porch where my computer is was so cold. I have an electric heater in here now so it’s comfortable. Temperature today…18 degrees…Heat Wave! Have a great week!! It’s supposed to get warmer here today too! Thanks, Jennifer. So often an omelette is the best choice for me. Have a great day! it’s currently -14 degrees C here (fahrenheit is? ?…) but the sun is out – hooray! stay warm, fran! yes – grab those chances to get together with family – always warms the heart, right?! I love adding cottage cheese to dishes, it adds a creamy, healthful, filling protein staying power. Stay warm Fran, my daughter wore shorts to school today but it’s supposed to get cold again here soon. I just came across your blog after writing a post called broken cookies don’t count…too funny! And it’s okay to take a break from veggies every now and then. No worries! Regardless of how you found me, Welcome! Your post was great and I’ll visit yours again. Please stop by here again as well! 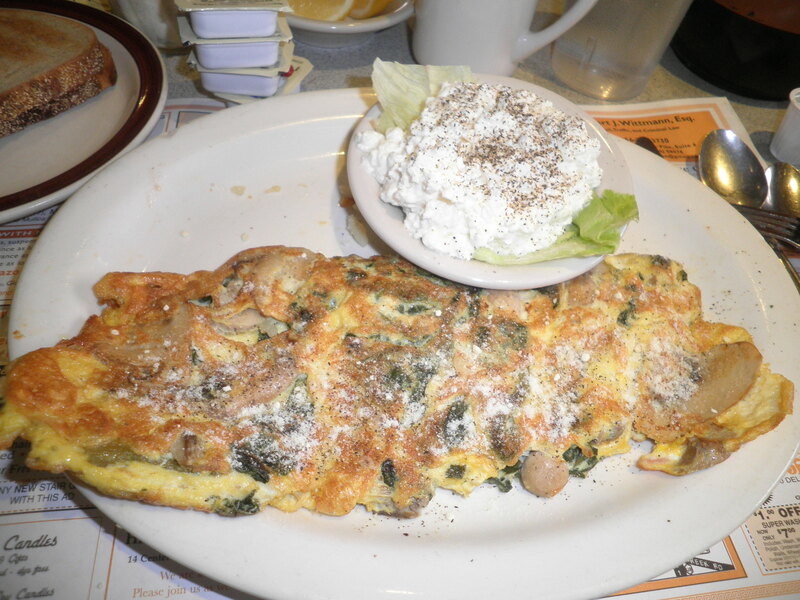 I love mushroom omelets:) Happy WIAW Fran! Aren’t mushrooms the best, Sunnie?! I never get enough of them. Strangely, I don’t buy them very often. They’re a great meaty addition to my stir fries. I was just at the produce market yesterday…Duh!! Have a great day! Fran – I’m going to say something (obviously, that’s what the comments are all about). If you decide to eat nothing, but junk food for a week straight and ultimately feel crappy and then guilty, that’s one thing. But, if you are feeling guilty about your food choices, in comparison to other bloggers, then please don’t. Everybody has their own tastes, needs, style. I know there are times I’ve thought this meal isn’t pretty or the healthiest, so I was embarassed to show it on WIAW, but then I figured to hell with that. The meal is realistic and accurate, and I’m happy with myself so I don’t care if other people see my chocolate choices or cheese platters as less than ideal. It’s ideal for me. Our blogging community is great and supportive, but sometimes it’s easy to compare ourselves to others and come up short. I just want you to know that. P.S. Your omelette looks delicious. Thanks, Meghan! You truly are always supportive and you give good insight on so many things. Thanks…we keep plugging along! Ooh, I want that omelet right now!